It is the chance that you might come across the error “ORA-28000: the account is locked“. To unlock the account, run below sql query in Oracle using admin user. I hope it would be helpful for the readers. Getting the foreign key detail of particular table is the most common tasks used by DBA or database developers. every time go to left panel, select table and right click to get foreign key details wastes most of the time. Drop the user define function from database if it exists. Below script will help to drop the scalar function present in SQL Server 2005 if exist. It is always good practice to write the drop statement before creating any stored procedure or the database function. Get the Fort night start and end date on the basis of input provided. if date falls in first 15 day then it will give the First Fort night start and end date and if date falls after 15 day then it gives respective start and end date. in some scenario we comes in very strange requirement. with me it happens. i needed to calculate date in which fort night the date is coming and on the basis of that calculate start and end date. so i have created below script. I hope it will be useful to readers. This time lets create the Scalar function in SQL Server to get the First Day and Last Day of the Week. Create below Scalar function in SQL Server to get the First Day of Week. Create below Scalar function in SQL Server to get the Last Day of Week. One of the features i love about SQL Server is function supports. Divide your task in functions just like other programming language. In this article i am going to show you that how to display the First Day and Last Day of Month in SQL Server. Now, Create Below Function to get the Last day of month. Its very frequent that we need to check whether particular store procedure exist in database or not? If stored procedure exist then delete the stored procedure, otherwise we have to toggle between Create Procedure and Alter Procedure. Below is the SQL to delete the stored procedure if exist. In organization, where huge number of tables present in database. its very hard to search the particular table. 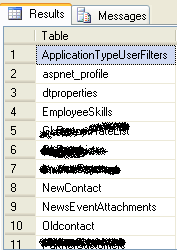 Here few SQL queries to search the table name by pattern. Clustered Index speeds up performance of the query ran on that table. Clustered Index are usually Primary Key but not necessarily. I frequently run following query to verify that all the developers are creating all the tables with Clustered Index.